How much does it cost to travel to Playa del Carmen? How much money will you need in Playa del Carmen? M$708 ($38) is the average daily price for traveling in Playa del Carmen. The average price of food for one day is M$249 ($13). The average price of a hotel for a couple is M$730 ($39). Additional pricing is in the table below. These average travel prices have been collected from other travelers to help you plan your own travel budget. How expensive is Playa del Carmen? Playa del Carmen is in Quintana Roo on the Yucatan Peninsula. It's a popular resort town and is about seventy kilometers south of Cancun. It has a European atmosphere with many small hotels and a nice relaxed feel. 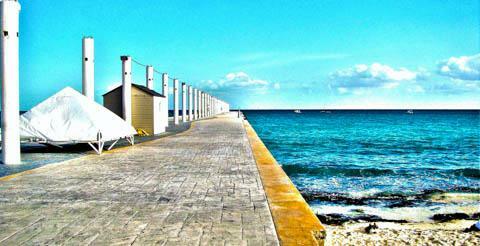 It was originally a small fishing town but tourism began with the introduction of a passenger ferry to Cozumel. The area developed rapidly and there are many luxury hotels, condos, and resorts. There are also American chains and a variety of shopping opportunities nearby. Playa del Carmen's temperatures are relatively consistent throughout the year. Highs in the summer months can climb to the low 90s Fahrenheit and highs in the winter months are in the low 80s Fahrenheit. Low temperatures in the summer months are in the mid to low 70s Fahrenheit and lows in the winter are in the mid 60s Fahrenheit. Rainfall peaks in the summer and early fall. This is also hurricane season. Most people come to Playa del Carmen specifically for the beach. There are variety of outdoor parks and reserves in the area that are worth a visit as well. Sian Ka'an Biosphere Reserve is about an hour from town and is one of the biggest protected areas in Mexico. This is a great place to go for bird watching or snorkeling. Rio Lagartos is another Special Biosphere Reserve. It's on the north side of the Yucatan peninsula and typically requires an overnight stay. Tourism in Playa del Carmen is centered around Quinta Avenida (Fifth Avenue). This is a pedestrian street that travels from Calle 1 norte to Calle 40. It's lined with many shops, bars and restaurants. You'll find boutique hotels and interesting dining opportunities nearby as well. Playacar is a residential, tourist development within Playa del Carmen to the south of the urban core. This where you'll you'll find most of the town's all-inclusive hotels as well as an aviary and a golf course. The development began in 1979. There are many opportunities for you to enjoy adventure sports and outdoor activities in the area. One popular option is charter fishing. You can easily find a simple boat to take you deep sea fishing, but do realize that many of these boats are unlicensed and will offer you little more than the bare essentials. It's better to inquire around and find a professional charter fishing company that can take you out. Scuba diving and snorkeling are also popular activities in the area. The reefs are only accessible by boat, but it is the second largest coral reef system in the world. Dive shops are ubiquitous and it is easy to arrange a trip. If you're traveling to the area specifically to go scuba diving, consider visiting Cozumel instead. The diving there is generally better. Other popular activities in the area include kayaking, and swimming. There are also beach clubs that line the coastline and are popular with the tourists. Playa del Carmen's nightlife is superb, but still more tame than Cancun. Popular clubs include Blue Parrot, El Pirata, Coco Bongo, Santenera, and Hotel Deseo. You'll find almost 75 restaurants around town of varying price. Your cheapest eating options are the pizza stands that are near the beach. In the evening there are many types of excellent Mexican street food which are also an excellent option. Definitely make a point of trying a seafood taco, which is a local specialty and easily one of the best options available. Mid range restaurants usually offer a nice sit down meal that includes seafood, tacos, or other local options. Lunch is a particularly good time to enjoy the restaurants as their atmosphere is laid back, relaxed, and affordable. The main town is laid out in a simple grid, making navigation easy and straight forward. You can easily walk most places, but if you're hoping to explore the outlying areas then renting a car is your best option. There are several reputable car rental companies around town. There's also a decent bus system that will take you to popular destinations around the region. Some people also decide to arrange an organized bus tour which is an easy and convenient way to explore the area. You can ask at your hotel and they can likely refer you to a reputable company. Taxis can be caught along many intersections on Fifth Avenue. There is a set table of prices, but drivers rarely offer those prices. You should know in advance how much a trip should cost and negotiate accordingly. Looking for a party hostel in Mexico? Heading to San Diego or LA?